Personal: Nickname “Belmo”…Married to Kimberly…Daughter Aria arrived in 2009 son Hugo in 2012 and newborn Sylvie in 2016…Took up the sport two-handed as a toddler when he was too small to roll the ball with one hand…Loves movies, plays a little golf, tennis, squash and Australian rules football...If there's one thing he likes to do more than throwing strikes is playing with his kids. 2019:Won PBA World Championship by defeating Jakob Butturff 236-227 in championship match for record 11th PBA major title surpassing Pete Weber and Earl Anthony with 10...Won Chameleon Championship by defeating Andres Gomez 236-194 in title match for 20th career title...Finished second in Go Bowling! Indianapolis Open losing to Norm Duke 239-217 in title match. Earned stepladder finals top qualifier honors for record-tying third consecutive tournament. Won PBA Tournament of Champions with 225-196 win over EJ Tackett in title match. Was record-tying 10th major, third TOC and 19th career win. Also became youngest to 10 majors milestone at 35...Finished second in PBA Players Championship losing to Anthony Simonsen 232-212 in title match. Was top qualifier in Players Championship finals for third consecutive year...Finished fifth in Roth-Holman Doubles Championship losing to winners Sean Rash and Matt Ogle 256-172 in opening stepladder match...Finished sixth in PBA Oklahoma Open...Finished third in season opening Hall of Fame Classic losing to Bill O'Neill 268-188 in semifinal match. Career: In 2018 finished second in Lucky Larsen Masters losing to Kyle Troup 248-232 in title match. Finished second for third consecutive year with partner Diandra Asbaty in PBA-PWBA Storm Striking Against Cancer Mixed Doubles. Won PBA Tour Finals by defeating EJ Tackett in roll-off of two-game final 40-26 after winning first game 239-205 and losing second game 219-170. Was 18th career title and second of season. Won Roth-Holman Doubles Championship with Bill O'Neill defeating Darren and Michael Tang 205-185 in title match. Finished fourth in PBA Tournament of Champions and second in Barbasol PBA Players Championship losing to Tom Smallwood 259-239 in title match. Earned fourth George Young High Average award with 221 average...Three major wins in 2017 helped Belmonte earn fourth Player of the Year honor in five seasons...Defeated Jesper Svensson 238-225 in title match to win 2017 PBA World Championship for record third major win in a season. Win was also ninth career major just one behind Pete Weber and Earl Anthony who hold record of 10. Finished second in Pepsi Scorpion championship losing to EJ Tackett 245-207 in title match. Won Lucky Larsen Masters in Malmo Sweden by defeating Cameron Weier 240-180 in title match. Won record fourth USBC Masters by beating Michael Tang 279-212 in title match. Win was his eighth career major and 14th career title. Won Barbasol PBA Players Championship for seventh major by defeating fellow two-hander Anthony Simonsen 221-204 in title match for first title in two years. Finished second in Main Event PBA Finals losing to EJ Tackett 666-628 in three-game championship match. Finished third in Grand Casino Hotel & Resort Oklahoma Open losing to Chris Barnes in semi-final match 256-218. Became PBA's 47th millionaire and fastest to achieve the mark at 131 tournaments breaking previous record of 180 tournaments by Wes Malott. Earned third George Young High Average Award with record 229.39 average..In 2016 finished fourth in PBA World Championship losing to Tom Smallwood in second stepladder match 224-185. Finished second with partner Diandra Asbaty in Xtra Frame Striking Against Breast Cancer Mixed Doubles. Finished fourth in FireLake PBA Tournament of Champions ending his run of consecutive TOC titles at two. Had productive Fall Swing finishing second in Detroit Open, third in Wolf Open and fourth in Badger Open. Finished sixth in USBC Masters ending his run of consecutive Masters titles at three...Accomplishments in 2015 earned him his third consecutive Chris Schenkel PBA Player of the Year honor joining Mark Roth, Earl Anthony and Walter Ray Williams Jr. as only players to accomplish the feat. Became the first player to win the USBC Masters in three consecutive years (2013-15) by defeating amateur AJ Johnson in title match, 202-157. 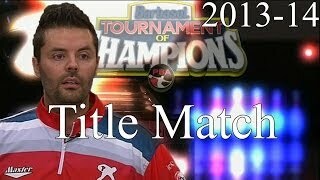 In 2015 won second consecutive PBA Tournament of Champions title defeating Rhino Page in Championship match 232-214 in title match. Became first player to win Masters and TOC in back-to-back seasons. Finished fourth in Players Championship losing to Tom Daugherty in second stepladder match 245-227. Teamed with Bill O'Neill to finish fourth in Roth/Holman Doubles Championship. Finished second to fellow two-hander Jesper Svensson in Bahrain International Open losing in championship match 258-244. Finished second in Maine Shootout losing to Josh Blanchard in three-game championship match 2-1. In 2014 became second fastest player to win 10 career titles (80 events). Finished fourth in Bear Open losing to eventual winner Tommy Jones in second stepladder match 221-210. Finished second in Oklahoma Open losing to Bill O'Neill 247-172 in championship match. Won 2014 Masters to become first player since Hall of Famer Billy Welu in 1964-65 to win back-to-back Masters titles. Defeated reigning rookie of the year EJ Tackett 221-177 for the title. Was the first time that a reigning rookie of the year and player of the year faced off in a major championship match. Masters win was second consecutive major title of the season having won Barbasol PBA Tournament of Champions by defeating Wes Malott 219-218 in championship match. 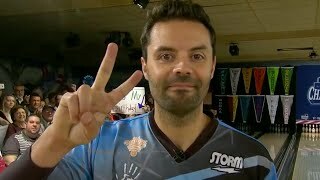 While not an official Tour event, won 2014 PBA Super Clash special event telecast on ESPN by defeating Sean Rash 743-718...2011-12 was a break out season for Belmonte winning three titles during the World Series of Bowling which included the Chameleon Open, GEICO Shark Open and Pepsi Elite Championship. Also finished third in U.S. Open, Tournament of Champions and Carmen Salvino Classic. Finished fourth in PBA World Championship, eliminated in the first match losing a roll-off to Osku Palermaa after tying the match 203-203. Advanced to World Championship finals by winning Mike Aulby Division finals bowling the 21st televised 300 game in Tour history. Narrowly lost in season's Player of the Year voting to Sean Rash...Won 2012 Australian Masters for his fifth PBA Tour title immediately preceding the PBA World Series of Bowling, defeating Sean Rash in the best-of-three title match. Belmonte won the first game, 174-172. Rash won game two, 255-223. In a dramatic comeback in the final game, Belmonte struck out in the 10th frame for a 256-243 win to claim the title...In his first partial year on Tour in 2008-09, became the first two-handed bowler to win a PBA Tour event by capturing the Bowling Foundation Long Island Classic which helped him win Rookie of the Year honors…Had three runnerup finishes in 2009-10 season...In 2010-11 had seven top-10 finishes with best finish of third twice...In 2012-13 won Lucas Oil Bear Open for seventh career and second title of the season by defeating Chris Barnes in championship match 235-211. Became third player to make TV finals in all four majors in one season...Won 2013 USBC Masters by defeating Wes Malott 258-245 in the championship match for his second major title. Became second foreign player to win Masters, Mika Koivuniemi was first. Finished second in PBA World Championship losing to Parker Bohn III in championship match 254-227. Finished second in Tournament of Champions losing to Pete Weber in championship match, 224-179. Finished second in U.S. Open, losing to winner Wes Malott 214-156 in championship match...Finished fourth in WSOB V Viper Championship losing to Stuart Williams 203-194 in opening TV match...Finished second in GEICO World Series of Bowling IV Chameleon Championship losing to Scott Norton 227-223 in championship match and third in Bowlers Journal Scorpion Championship losing to eventual winner Tom Daugherty in semifinal match 256-187. 2014 - Oklahoma Open, Shawnee, Okla.
2019 - PBA Tournament of Champions, PBA Players Championship. Won 2018 WBT men's finals with 10-8 sudden-death roll-off win over Marshall Kent after tying at 267 in title match...Earned third consecutive Best Bowler ESPY and fourth overall in 2017... Has won numerous titles on the world stage including the 2007 World Tenpin Masters…Finished second in 2007 QubicaAMF World Cup…Won Indonesian Open in 2008...Won 2011 Thailand Open defeating fellow PBA tour player Mike Fagan 300-205...First to qualify for World Ranking Masters in two zones…Gained enormous media attention in 2008-09 for his two-handed delivery…Won 2011 Qubica/AMF World Cup by defeating fellow PBA Tour player Tommy Jones 2-1 in best of three game match in Johannesburg, South Africa...As part of Team Australia, won trios bronze medal in 2014 WBA Men's World Championship. 2014 - Harry Smith Point Leader Award.